Description: "Plants terrestrial, forming diffuse mats. Stems long-creeping, branched, branches 3-forked, flat, articulate, glabrous. Rhizophores borne on upper side of stems throughout stem length, 1-3 mm in diameter. Leaves delicate, papery. Lateral leaves nearly perpendicular to stem, well spaced, green, lanceolate, 2.5-3.6 x 0.8-1.2 mm; base rounded; margins slightly transparent to green, dentate; apex acute. Median leaves lanceolate to linear-lanceolate, 2-2.7 x 0.6-0.8 mm; base with small outer auricle; margins slightly transparent to green, dentate; apex acuminate. Strobili solitary, 0.2-2.5 cm, with only 1 megasporangium, megasporangium basal; sporophylls keeled, dentate, strongly tapering toward apex, base glabrous, margins denticulate, apex acuminate; megasporophylls larger than microsporophylls, in groups of 4, 2 like vegetative leaves, 2 like sporophylls, of the latter 1 large, lanceolate-elliptic, 1 smaller, falcate-lanceolate; microsporophylls lanceolate to narrowly ovate-lanceolate" (Flora of North America online). "Horizontal rhizomes long-creeping, 4-5 mm wide including the very distant lateral leaves. Erect stems 1.5-6 cm long, pseudodichotomously (appearing somewhat pinnately) branched. Branchlets ca. 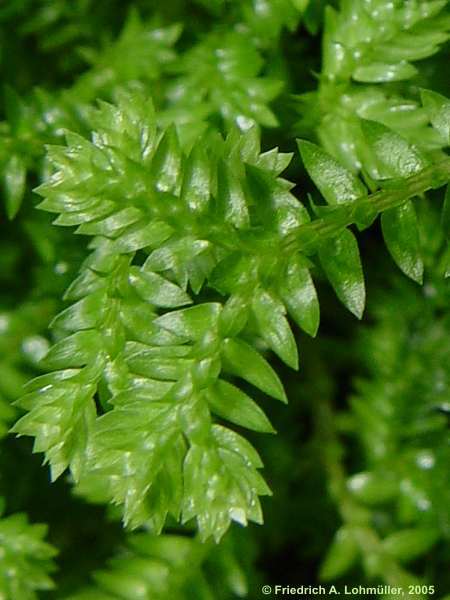 3.5-4 mm wide including the rather closely spaced lateral leaves. Lateral leaves elliptic-lanceolate, 2.5-3 mm long, 0.8-1 mm wide (ca. 1/4 smaller on the branchlets), minutely and evenly ciliolate. Cones tetragonal, 2-12 mm long, 1 mm wide" (Lettinger, 1985; p. 69). Habitat/ecology: Terrestrial on riverbanks, along lake margins, and in well watered lawns" (Lettinger, 1985; p. 69). Cultivated as a decorative plant. In Hawaii, "it grows in lawns, edges of fields, and along trails and roadsides in wet areas" (Wilson, 1996). Propagation: Spores and stem fragments. "Damp forest floors, stream banks". Control: "Tiny fragments persist that are difficult to find. Clear and maintain from tracks, especially at their ends, to prevent movement further into the bush area. Peg sites out to facilitate identification when following up, and check 3-monthly for regrowth." Physical: "Pull out very small areas. Dispose of at a refuse transfer station, burn or bury deeply." Chemical: "1. Spray: 100ml glyphosate + 2g metsulferon-methyl 600g/kg + 10 ml penetrant /10L. Follow up 3-monthly until site clear (possibly 4 times). 2. Spray: glyphosate (20ml/L). Follow up as above" (Weedbusters New Zealand). This page was created on 18 JAN 2004 and was last updated on 22 AUG 2011.